The health benefits of marijuana are now getting a good deal of attention. Yet hemp—a close relative of marijuana—is actually a far richer source of CBD, the compound responsible for effectively treating dozens of disorders, and contains very little THC, the substance responsible for marijuana’s highs. Sounds like growing and using hemp is a win-win situation, right? Not quite, because the US government, which holds the patent for CBD specifically because of its healing abilities, has unfairly classified hemp as a Class 1 drug, thereby banning people in the United States from growing it commercially. If you find this confusing, you’re not alone. That’s why best-selling author Earl Mindell has written Healing with Hemp CBD Oil, a straightforward book that will first help you understand what’s going on with hemp oil in the United States, and then teach you how to use this valuable natural remedy to improve your health. The book begins by looking at the important role the hemp plant has played in both Eastern and Western societies as a source for paper, textiles, rope, and so much more. This is followed by a discussion of the science behind CBD’s medical benefits. The author then provides a consumer’s guide to buying hemp products—especially its oil and its CBD supplements—and offers an eye-opening examination of hemp’s legal status in the United States, from the 1900s to now. Finally, based on up-to-date studies, Dr. Mindell presents an A-to-Z guide to the many uses of hemp oil and CBD for various health conditions, from arthritis to depression to heart disease. Although the United States has given CBD-rich hemp a problematic legal status, fortunately, this product—sourced from other countries—is readily available. Healing with Hemp CBD Oil guides you in using this all-natural substance as a safe, side effect-free remedy. I wish to express my deep and lasting appreciation to my friends, associates and especially to my family, Gail, Alanna, Evan, Lily and Ryan, for their assistance and understanding in the preparation of this book. I would like to thank my editors at Square One, Erica Shur and Caroline Smith, for all their talent and efforts in making sure that all the material in this work was clear and accessible. Imagine that researchers had found a naturally occurring substance that could effectively overcome dozens of health disorders without any serious side effects. Now imagine that the plant in which this substance was found had been banned in this country because, as a commercially grown crop, it threatened other competing “cash” crops. As new studies showed its many medical benefits, our laws continued to prevent farmers from planting an easy-to-grow crop that requires few, if any, pesticides or herbicides. If you think that sounds so crazy that it couldn’t be true, think again. For the last seventy years, the Federal Government has prohibited farmers from commercially growing the hemp plant. In doing so, it has effectively prevented American companies from making available CBD—the very compound that science has found to be an amazing and versatile healer. As it turns out, hemp is a relative of marijuana. Both are cannabis plants, as are many other plants. However, while marijuana is high in THC, the chemical compound that accounts for marijuana’s psychoactive effects, hemp contains too little of this chemical to get anyone high. On the other hand, while marijuana contains a relatively low level of the healing compound CBD, hemp is high in CBD—which has no psychoactive effects. Yet as you will discover in the chapters that follow, for decades, the hemp plant has been outlawed along with marijuana because the government has falsely classified it as a dangerous Schedule 1 drug. And while more and more states are legalizing the growth and sale of marijuana, hemp is still not permitted to be grown as a commercial crop. As a registered pharmacist, I have witnessed the amazing growth of pharmaceutical companies over the years. I have also seen too many of these companies produce drugs that may relieve specific symptoms, but come with dangerous side effects. I have always looked for natural products that can provide the same relief without the risk of side effects. That is not to say that pharmaceutical companies don’t produce life-saving drugs, because they do. However, nature has provided us with many alternative solutions that work well. Over the years, as I read more about the many benefits of hemp oil and CBD, I discovered that hemp’s classification as a Schedule 1 drug made no sense in light of the available scientific research. I needed to know more. Healing With Hemp CBD Oil is the result of my investigation into this important product. The book is divided into two parts. Part One presents the basics of hemp. It begins with a look at hemp’s impressive history and its importance as a popular crop grown throughout the world. 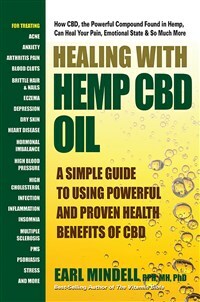 It goes on to explain the groundbreaking scientific research into hemp oil and its healing effects on the body. Because of the amount of misinformation about hemp oil products, Chapter 4 is devoted to making you a smart consumer who knows how to buy, use, and store hemp oil-based produces. Part One concludes with an eye-opening review of the law, medicine, and CBD. Part Two provides an A-to-Z listing of specific health disorders and how hemp oil can be used to relieve them. Each entry includes an explanation of the problem, its most common symptoms, its causes, and its standard conventional treatment and side effects, if any. The entry concludes with a discussion of how you can use hemp oil to improve your health. At the end of the book, a resource section guides you to the organizations and websites that can assist you in learning more about hemp. For those who wish to read the research papers and articles on which this book was based, you’ll also find an extensive list of reference. The information presented in this book is not meant to replace the medical advice given to you by your physician. It is designed to provide the facts you need to know to make informed decisions about your health. If in reading this book you find a treatment that is of interest to you, do not be afraid to discuss it with your doctor. You can play an important role in your own healing process. As much as I want to guide you to safe treatments for your health problems, I also want this book to get you angry. The United States government has banned our farmers from commercially growing hemp, one of the world’s most important crops. After reading the pages that follow, I hope you agree that the time has come to change the law and allow both our farmers and our people to benefit from this amazing plant.